What is a football guy? Dan “Big Cat” Katz and PFT Commenter of Barstool Sports gave a presentation to a packed Mount Carmel Auditorium on Thursday, Oct. 19 to answer that question. Barstool Sports, a satirical sports blog, has skyrocketed in popularity recently with its catchy “Saturday’s Are For The Boys” movement and “One Bite, Everyone Knows The Rules” pizza reviews. The company and its writers are known for their controversial and candid writing style. They have no filter and are never afraid to offend anyone. It is an unconventional news outlet that has frequently been at the center of attention, both good and bad, since its founding by Dave Portnoy in 2003. It has become a more powerful source in the industry since its sale to businessman Peter Chernin in January 2016. Big Cat and PFT rose to fame in 2016 when they started the “Pardon My Take” (PMT) podcast through the Barstool Sports platform. Since its debut in February 2016, PMT, which frequently tops the Apple Podcasts rankings, has had dozens of celebrity guests including J.J. Watt, Blake Griffin, Michael Rapaport and Kareem Abdul-Jabbar to name a few. The PMT guys continue to rise in the sports media landscape, as they hosted their first television show on Wednesday, Oct. 18, at 1 a.m.
Their new show, Barstool Van Talk (BVT) was scheduled to air Wednesday mornings at 1 a.m. on ESPN2 until at least Super Bowl weekend, but was abruptly canceled before the second episode aired. ESPN felt that it could not distance itself from Barstool with BVT, so it felt the best decision was to discontinue the show, according to a statement from ESPN President John Skipper. With the help of former Barstool Sports interns Tyler Brosious, a Quinnipiac graduate student, and Jordan Novack, a Quinnipiac senior, as well as Quinnipiac professor Rich Hanley, the PMT boys took to Hamden to give a lecture about “football guys.” The presentation was initially meant for Hanley’s JRN 362 “Story of Football” course, but was open to all Quinnipiac students. 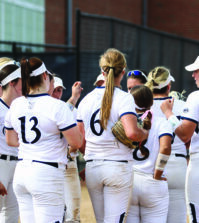 ESPN cameras were present at the lecture and the footage was expected to be used in BVT’s second episode. It is unclear what will happen to the footage and if it will be used at all. A popular segment on PMT is “Football Guy of the Week,” where Big Cat and PFT nominate a few people they deem worthy of the accomplishment. But that begs the question: what even is a football guy? This is what Big Cat and PFT tried to teach the Quinnipiac students. Big Cat and PFT felt as though they have met many of the greatest football guys in the world, but they themselves have not earned that title. They are just supporters of football guys, making them football guys guys. After clarifying their position among football guys, Big Cat and PFT finally began to explain what a football guy truly is. Reading each and every word off their slideshow, Big Cat explained the most important trait of a football guy. PFT, known for his love of Thursday Night Football games because of the “Color Rush” uniforms NFL teams wear, explained how he prepares for the big day. The lecture then turned to traits of a football guy, which was a common theme among the slides for the entire lecture. PMT visited Ohio State over the summer and took a tour of its football facilities, including Meyer’s office. Big Cat told the audience that when they entered Meyer’s office, they saw a framed “love contract,” as Big Cat described it, that said Meyer was obligated to love his family and spend time with them each week. 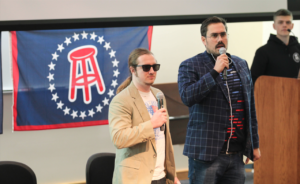 Moving the focus toward many of the journalism majors that were in attendance, Big Cat and PFT did a section about those hoping to break into sports media. The slideshow changed from a happy rat to a dead rat, and the crowd went wild. One of the final “traits of a football guy cont” slides was “football guys will go to any length to win a football game.” They showed a photoshopped picture of Arizona Cardinals head coach Bruce Arians coaching on the sidelines drinking paint out of a can. The ability to drink paint and coach football at the highest level certainly qualifies Arians as a major football guy, according to Big Cat. To conclude their lecture, which was supposed to be an hour but lasted just 29 minutes, they gave an oral test to the audience. “Raise your hand if you’re currently sitting in a classroom,” Big Cat said as only some people raised their hands. “Oh wow, we’ve got some brainiacs not raising their hands. Let me rephrase this: raise your hand if you are currently attending a school-related function,” PFT said as everyone raised their hands. Unfortunately, no one in the audience was deemed a football guy. For the final 31 minutes of the presentation, they showed the audience a 15-minute clip of “Playmakers,” an old ESPN show, for a segment that aired on their podcast on Friday, Oct. 20, followed by a few questions from students. Every seat in the auditorium was filled, and there were even some students sitting on the stairs. Based on the size of the crowd, the appearance by the PMT crew at Quinnipiac was one of the most popular of the school year. Barstool is growing by the day in the sports media world. They have over three millions followers on Instagram and nearly one million followers on Twitter. The way they do business cannot be overlooked in the ever-changing journalism landscape.